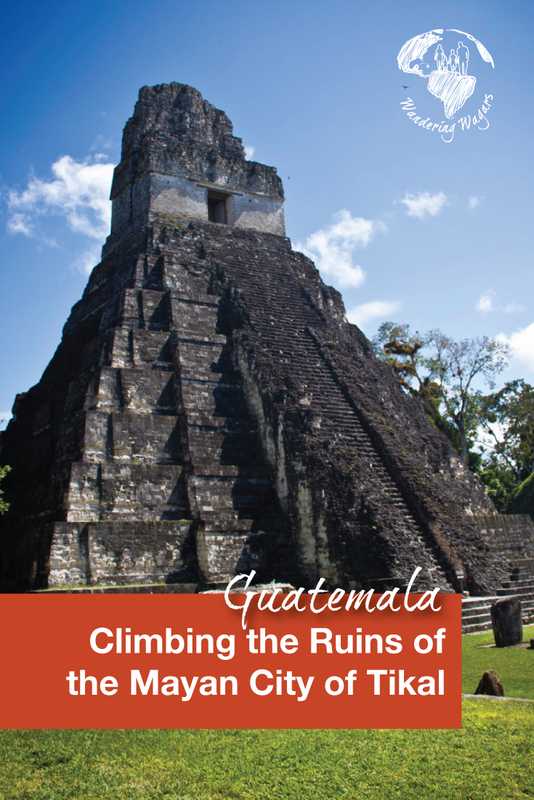 Deep in the heart of the Guatemalan jungle, half buried under earth and trees sits one of the most spectacular ancient ruins on Earth. The Mayan city of Tikal, complete with housing, temples, palaces, public squares and ball courts, is an absolute treasure to behold. One of the most incredible things about this set of ruins is its genuine feeling of authenticity. This authenticity is something that I didn’t experience in some other Mayan ruins. Many visitors flock to Tikal from towns like Flores in Guatemala. 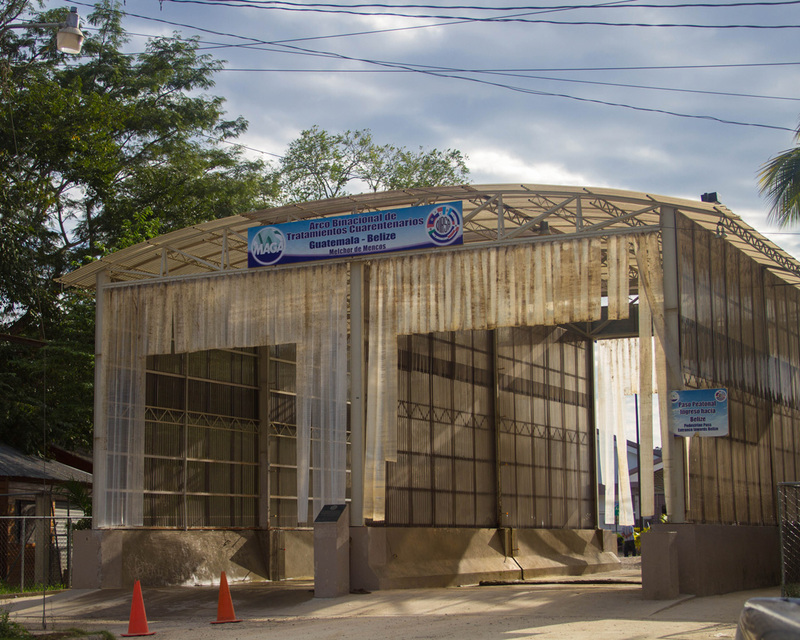 We were exploring neighboring Belize and made the journey early in the morning from Belmopan. After a trip just shy of 3 hours, we crossed the border into Guatemala by bus. The trip included a stop at the border for passport checks and a quick snack and drink before continuing. 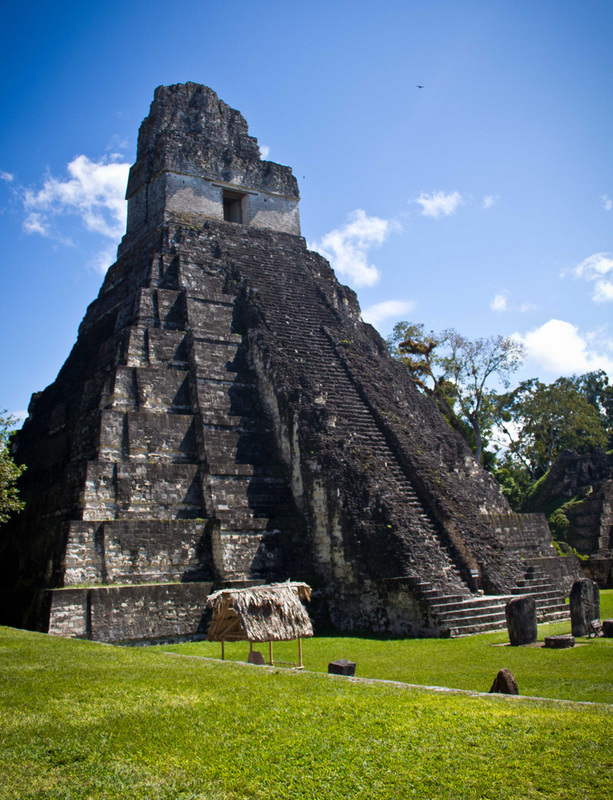 Tikal National Park, which contains the Mayan city of Tikal, is in the Peten province of Northern Guatemala. The park is in an area often referred to as the Maya Forest. Tikal has the distinction of being one of only a small number of UNESCO World Heritage sites protected by both cultural and natural regulations. This is due to both the incredible biodiversity of the surrounding forest and for housing the incredible Mayan city of Tikal. The city was a major part of Mayan civilization from the 6th century B.C. 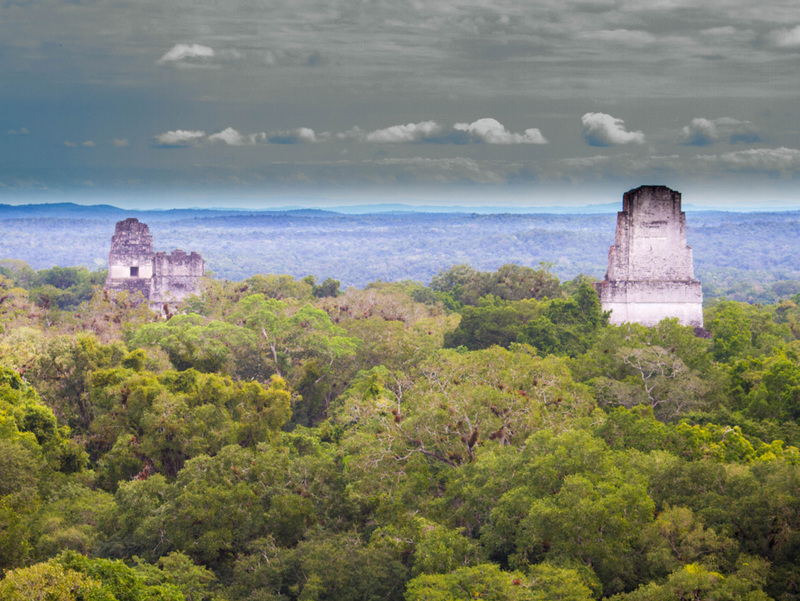 up until the 10th century A.D. Tikal remains as one of the most important archaeological sites left by the Mayan people. Many of the buildings still contain the original artwork. Stone carvings, murals, and hieroglyphics can be found in many of the buildings within the site. Pro-Tip: There are no ATMs in Tikal and vendors don’t accept credit cards. Make sure that you bring cash. The entrance to Tikal is priced at approximately $150Q ($20 US) and the park is open from 6:00 AM until 6:00 PM. The city covers a massive area. Many of the ruins are still partially, if not completely covered in layers of dirt and jungle from a millennium of neglect, and making your way through the jungle paths to the different features can take a while. Don’t trust the signs either, they often fall and are placed back facing the wrong direction. The Grand plaza in the Mayan City of Tikal is one of the most famous within the city. The Grand Plaza was used mostly for ceremonial activities. 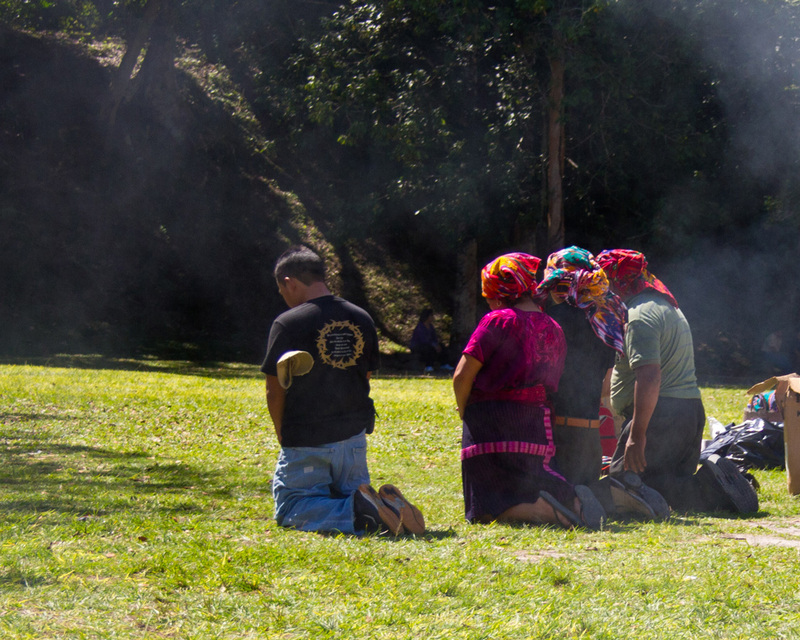 Contrary to popular belief, the Mayan culture is still alive in Central America, and while we were visiting we had the opportunity to witness a Mayan prayer ritual within the Grand Plaza. Seeing this was very unexpected and we were told by the guide to be very respectful and silent around the ceremony as it is real deal and not something put on as a display for tourists. The Grand Plaza includes Temple 1 (Temple of the Grand Jaguar) and Temple II (Temple of the Masks). The grounds offer amazing places to explore, including residences and a ball court where the ancient and deadly Mesoamerican ball game was played. Temple II has wooden stairs, making it a relatively easy climb for children. Pro-Tip: Temperatures in Tikal can increase dramatically in the afternoon and the Grand Plaza does not offer much shade. Make sure to pack sunscreen and lots of water for exploring. Temple IV, also known as the Temple of the Two-Headed Snake is the tallest structure in Tikal at a whopping 70 M (230 ft). 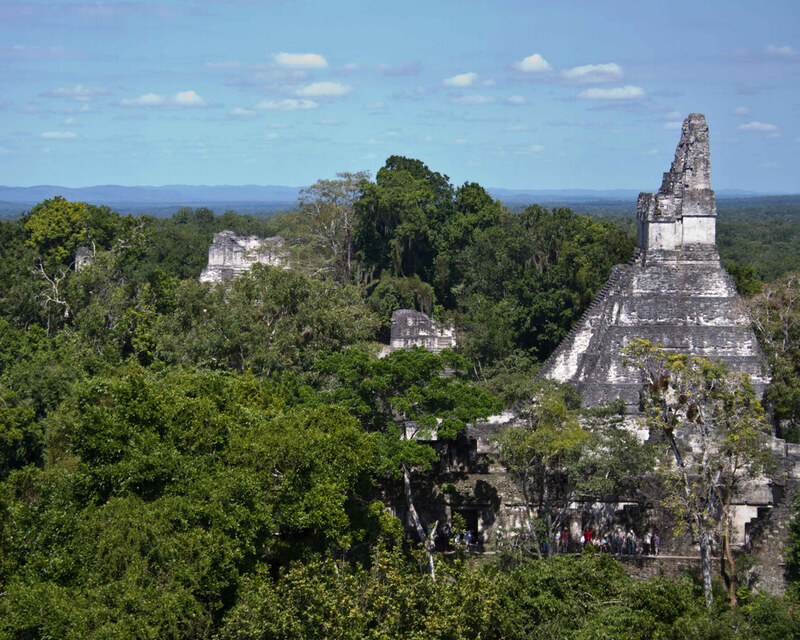 Within the Mayan city of Tikal, Temple IV is the place to be to watch the sun rise over the tropical forests. The climb up to the top involves a combination of rickety stairs built on scaffolding and the original structures uneven and crumbling stairs. The drops on all sides are steep. The stairs can be a heart-pounding experience for those who aren’t used to it. The views, though, the views are worth the effort. Temple IV became famous for its “Star Wars” view. The Millenium Falcon could be seen shooting out from the temple peaks as it appeared as part of the rebel base during A New Hope. If you love your Sci-Fi like I do, then it’s worth the trip just for this! Tikal is one of the few Mayan cities we have visited where the living quarters of the locals have been unearthed and are accessible to visitors. The temples and palaces are cool. But, there is something about laying down, where 2,500 years before, someone else slept, dreamed, and rocked their children to sleep that truly brings an ancient city to life for me. The Central Acropolis is a labyrinthian mix of residences and palaces. They are a blast to explore and offer respite from the afternoon heat. There are countless trails that snake through the jungles surrounding the Mayan city of Tikal. Many of the trails lead to older buildings that have not been fully explored. Hiking through the jungle is a great way to beat the afternoon heat. Go ahead. Tap into your inner Indiana Jones. In addition, there is the opportunity to run into some of the local wildlife. 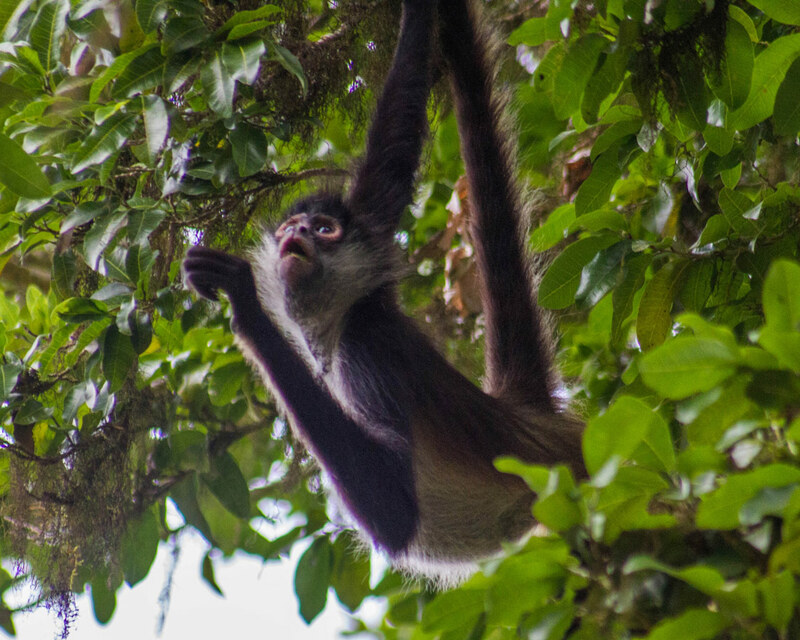 During our hike, we saw spider monkeys, parrots, and even a tarantula! Last, there were some cool tunnels that you can crawl through beneath the forest floor. The Mayan city of Tikal managed to capture our hearts, minds and souls. There is something truly magical about this place that can be experienced only while visiting. The locals and guides were wonderful. The surrounding nature was spectacular. Tikal felt like an entirely new world just waiting to be discovered. Great pics! I’ve been obsessed with Mayan culture since 5th grade and can’t wait until I finally get to see this in person! Very lovely post, Kevin. 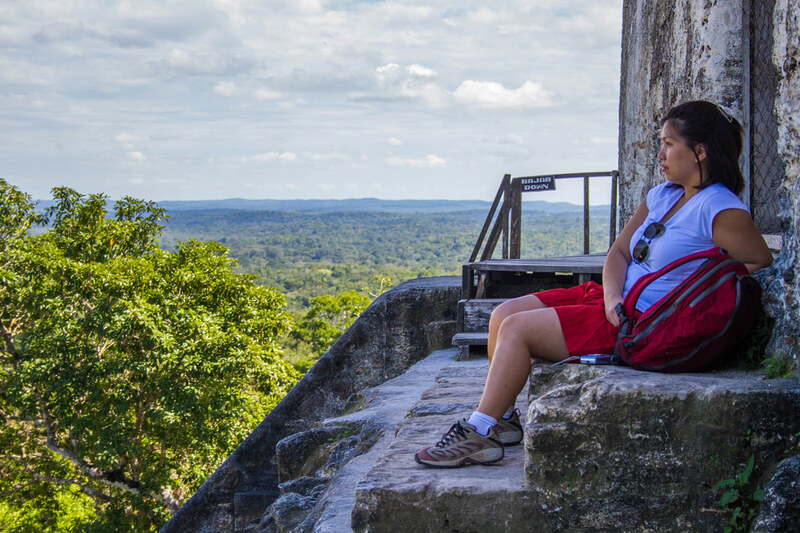 I love the photos, and I love feeling the excitement and passion that you shared as you and Christina explored Tikal. 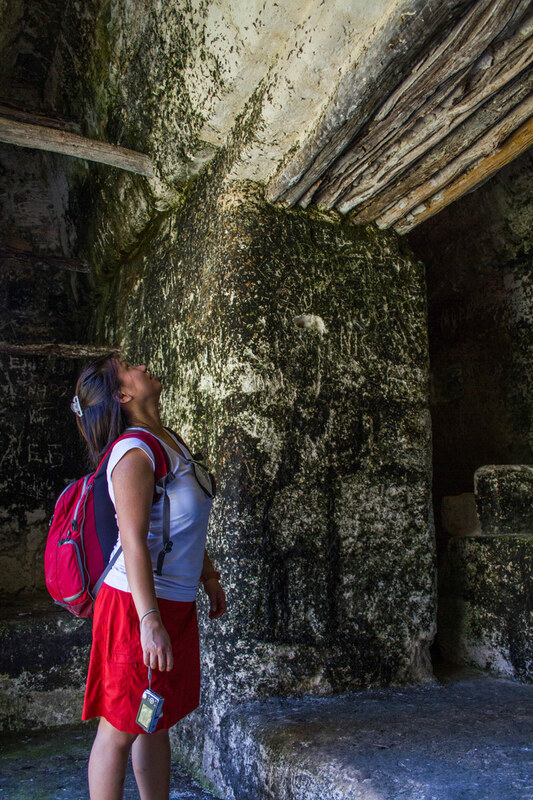 I have explored several Mayan ruins and have always felt the same way. They are breathtaking and inspirational. So happy to hear you say that Doreen! It’s a pretty incredible experience walking through history like that. Great post! My boyfriend and I were just there a month ago. We stayed in Flores and did a tour from there. It is interesting to read your experience doing a tour from Belize. I definitely agree about the signs – you can not trust them and it is so easy to get lost! It’s such a huge park and one of the most impressive ruins that we have explored. Thanks! I love all the great places you are going! Tikal looks wonderful and I think it would be great to try the hiking trails. I was so scared of the spider handling! Ahhhhh! Spiders! Tikal truly is an expansive site isn’t it. We felt a visit to not so distant Copan (in Honduras) is well worth it as well, as together they make a complete package. Tikal has the grandeur, whilst the carvings in Copan are in immaculate condition. We haven’t yet visited Honduras, but when we do, we’ll make sure to add Copan to our itinerary! Kevin, what fantastic pics. Never been to Guatemala — now I want to go! Thank you Scott! I hope you make it. It’s got a lot to offer! I love the way you narrate the beauty of this Mayan ruins. You say in such flare! Your exploration of this beautiful ancient place was an adventure and for that, thank you for sharing. Oh man these stories remind me of the time I used to read TinTin comics. Truth be told, my passion for wanting to travel to distance places (which I still haven’t) came from them. Another thing I was thinking about while reading this, is that why these amazing places need to be touristy and people be charged to see them. It’s crazy how we have to pay for everything and nothing is something that we could just explore without monetary attachments. We used to read TinTin too! In fact, my wife’s nickname is TinTin, Coincidence? I think not! As for the fees for entry, it’s important to remember that running, and most importantly, maintaining and excavating the ruins is not a fast or cheap process. Your entrance fee’s help support the local economy and support the researchers and archaeologists that make these amazing places accessible. If it wasn’t for them, all of this would still be buried under the forest floor. I was hoping to get to Tikal last time I was in Central America. I was just so floored by the history and grandeur of the Angkor Temples, that Tikal seemed like a place I would like, for sure! Though I didn’t make it last time, maybe I’ll need to make a special trip. Is this a multi-day type place, or can you see most of it in one day? Two days would give you time to explore deeper into the older areas, but the city can be explored pretty thoroughly in a day. Thank you so much for sharing your wonderful experience! I never knew that I needed to visit here, but after reading your article I’ve put it on my list! We’re so happy to hear that! I hope you have an amazing time! Beautiful pictures! I visited Lamanai Ruins in Belize, and it was a wonderful experience! Wow, what were these tunnels in the jungle floor? And I liked the Indiana Jones reference. Would totally have felt like that when walking the Mayan ruins. It looks like a fun trip! Ahh I can’t believe you held a tarantula! I was actually thinking of Indianan Jones right before I saw your Indiana Jones reference haha. I really want to go to Guatemala after reading your post! These ruins are very similar to what we’ve seen in Yucatan – all beautiful. wow! i haven’t seen mayan ruins yet but am headed to mexico this winter so hopefully ill see some then! Wow, this is incredible. Love the Star Wars relation, and thanks for the tip on the signs! Wouldn’t want to get lost in there, what an amazing piece of history. Being passionate about history and lost civilizations, I loved this post a lot. The history of the Mayan civilization is indeed fascinating, and it would have been quite an experience walking amongst the ruins. Great pictures vividly recollect your experiences. So much to explore in Tikal that makes me want to stay for a week or more. Loving your exploration in the residences and tunnels of the Central Acropolis. The place indeed look magical. Wow! Would love to check it out someday. It reminds me of temples in Cambodia. Beautiful! Wonderful place with a so fascinating culture! I didn’t know the Mayan culture hadn’t disappeared. Kevin, I feel like I have taken a virtual tour of the ruins through the post. I can’t wait to get there and see them in real. Thanks for the kind words! I hope you get the opportunity! I just shared this with two of my friends. We take an annual girls trip and this looks like a fun idea. Especially starting out in Belize and then venturing to Guatemala. I have been a student of history in my school and love to hear about ruins. the Mayan ruins have always fascinated me. I have never been here and am not sure whether I would be able to in some time soon . I do hope I get a chance to visit this place soon enough. Looks otherworldly! Loved following the incredible journey of your explorations! And even discovering the wildlife around makes it seem like a huge adventure, thanks for sharing!